The following pages reproduce a 1987 report issued by the Michigan Department of Transportation in response to public concerns about the safety of the Zilwaukee Bridge, then nearing completion. The text here is reproduced word-for-word from the original report and no alterations—grammatical or otherwise—have been made. With repairs finished and the bridge about 60 percent complete, MDOT on September 14, 1984, took bids on a new contract to finish the project. It contained a closely monitored, step-by-step construction process to insure that the work went smoothly and without incident. Two engineering consulting firms, widely experienced internationally in bridge construction, assigned personnel full time to the Zilwaukee Bridge project. The low bid of $35.9 million was submitted by S. J. Groves & Sons of Minneapolis, Minn., a prime contractor on the I-205 concrete segmental bridge at the Columbia River. The new contract required the contractor to hire an independent engineering consultant firm experienced in the design and construction of segmental concrete bridges to assist in all aspects of the project. S. J. Groves hired T. Y. Lin International of San Francisco. MDOT retained Howard Needles, Tammen & Bergendoff (HNTB) of Kansas City, Mo., which had consulted with the department on the bridge repairs. Both consultants, widely experienced internationally in bridge construction, have assigned personnel full time to the Zilwaukee Bridge project. HNTB reviews proposals for work to be done which are submitted by the contractor. The contract requires all parties—MDOT and its consultant, plus the contractor and its consultant—must review each construction procedure before work can proceed. S. J. Groves resumed construction on the northbound bridge and continued work until shutting down for the winter of 1984-85. At that time, 643 of the 1,592 segments had been erected, leaving more than 900 still to be placed. Work began again in April 1985 and continued through the frigid weeks of December and early January. The winter shutdown was later than usual because the contractor wanted to place the last of the segments on the northbound bridge in order to begin moving the launching girder onto the southbound bridge for the 1986 construction season. The company devised an ingenious method of warming the concrete segments so that they could be erected in sub-freezing temperatures. The efforts were successful, but because of the cold weather, some cable ducts could not be sealed with cement grout as would normally be done. The ungrouted ducts allowed water to be trapped in some segments, which froze and caused "spalling," or circular cracks on the concrete surfaces. The spalling does not affect the strength and structural soundness of the bridge. 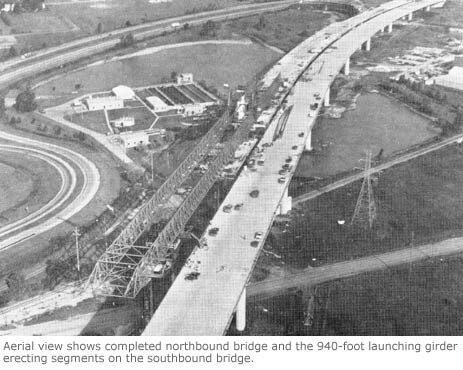 Construction on approaches and ramps to the bridge is expected to begin early summer 1987. The cost of the bridge is $117.5 million, less the sum to be realized from the sale of equipment and the segment fabrication building. Another $9.8 million will be spent on ramps and approaches.